Get a taste of Tinseltown right here in the Tri-State, thanks to the videography savvy experts at True Artists Studio. 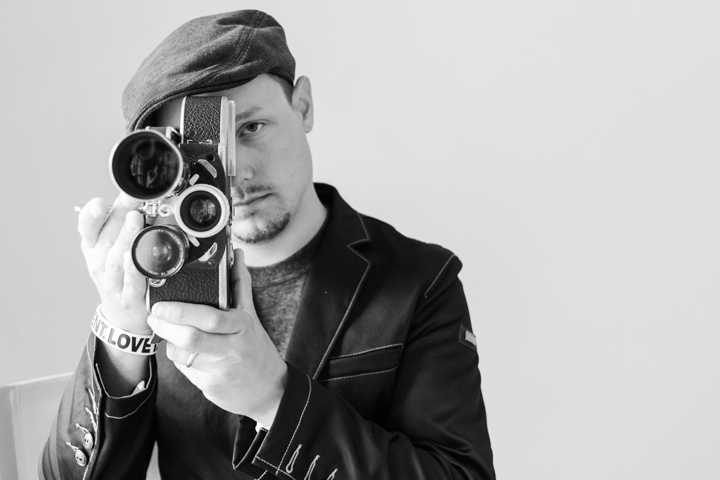 With a degree in video production, more than 12 years of experience and numerous awards, Shane M Pergrem is a filmmaker who’s passionate about storytelling. Stories right here in Cincinnati. The True Artists Studio specializes in a variety of productions. “Just about anything,” laughs Pergrem, “the sky’s the limit.” But the demand for one type of production in particular is quickly increasing: social media engagement videos. Interested in telling your story? Whether a business, bride or noble mission, call True Artists Studio at 859.305.1547, email at video@trueartistsstudio.com or visit online at trueartistsstudio.com. Watch the webcast below to learn more about True Artists Studio. Cincy Chic: Tell us the story behind Miss Em’s and what inspired you to open? 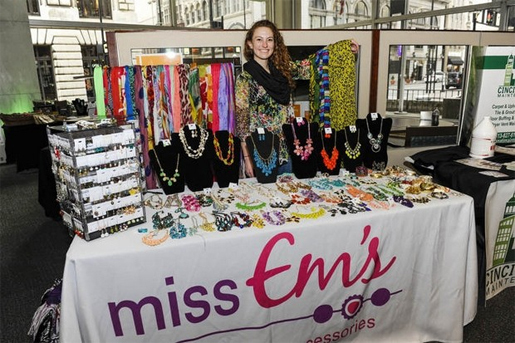 Emily Madden, owner of Miss Em’s: I started Miss Em’s based off of a project that I had to do while attending The Ohio State University. I was studying Fashion Merchandising and Marketing and they had wanted us to create a business plan for a company we would be interested in doing. I created the business plan and showed it to my parents. The plan was to create a jewelry/consignment store. My parents both were very proud of my plan and asked me why I didn’t start something like this while I was in college. From there, I started purchasing my first items, applied for my business license and started hosting parties with family and friends. Now I have a great company that people in the Cincinnati, Columbus and Chillicothe areas are really starting to recognize! I also started doing home parties, craft shows, fundraisers and large events in Cincinnati. Cincy Chic: When did Miss Em’s open? Madden: I opened Miss Em’s in June 2008. Cincy Chic: What makes you unique from other businesses? Madden: It’s really my price point that sets Miss Em’s apart. There are definitely a lot of other jewelry businesses that do home parties, but they charge you an arm and a leg. I remember going to a jewelry party in college and feeling guilty that I didn’t buy something at a friends party, but I couldn’t afford it while in school. The items were gorgeous, but not really in my budget. I make it my goal to provide everyone with something they can purchase! Items start at $5.00 and are just as nice as things that you’d find in a boutique, large department store or with any other in-home party company. I really want to be able to make people feel good on the inside while looking great on the outside but without breaking the bank! I also typically only get one of each item, so that way people are leaving a party or fundraiser knowing that there won’t be 20 others walking around wearing the same thing. Not only are they getting one-of-a-kind jewelry but they also get to take it home with them once they purchase it. I have women who are always looking for me at events now because they know they can purchase multiple items for the same price as one somewhere else. Cincy Chic: What kind of successes have you seen with Miss Em’s since opening? Madden: I went from having one or two home parties a year at my parents home to now having multiple parties a month and with new clients all the tim. My client list has grown significantly because so many customers tell their friends about Miss Em’s who then pass along information about different open houses. It’s been absolutely amazing to hear how many women come back to an event with Miss Em’s and tell me how many compliments they received when wearing one of my pieces. This past year, I was able to open up an online store. i’ve even seen an increase in sales from other states, all because of friends telling their friends about Miss Em’s. Everyone can appreciate having items for great prices, so it’s been really amazing to have so many women spreading the word. In terms of parties – I’ve had more and more people interested in hosting parties at their homes. It’s a lot of fun and enjoy listening to what customers really need and hopefully offer items that will work for their needs, which makes parties really fun and allows everyone to enjoy shopping with food, drinks and great company. Since I started, I also have a group of ladies – my loyal ladies – who continue to purchase jewelry from me party after party. These women attended my very first party and remain Miss Em’s biggest advocates. My loyal lady list is continuing to grow. Cincy Chic: Where can we find Miss Em’s? Madden: I do everything out of my home, so I don’t have a store front. But I’m always traveling for parties, fundraisers, events, craft shows, etc., so it’s pretty easy to find me. I also have an online store at MissEms.com, where you can purchase jewelry and accessories. Cincy Chic: Is there anything new for the future? Madden: For the future, I’m looking into adding another line of either purses, bridal or luxury items. Iv’ve had so many people reach to me regarding their wedding jewelry or gifts for bridesmaids that having bridal options will likely be the next step. Brides are already spending enough on the wedding, so shopping with Miss Em’s has been a great way for brides to find jewelry that they love without the expensive price tag. Plus, they look just as good as if they were to buy high-priced items. I am looking into adding another line of either purses, bridal or luxury items. I have had so many people reaching out to me regarding their wedding jewelry or gifts for their bridesmaids, that having bridal options will most likely be the next step. Cincy Chic: Can you tell us more about your Jewelry Open House? Madden: Every year I do a huge Jewelry Open House at the Anderson Senior Center on Beechmont Avenue. This event allows all of my clients the opportunity to stop in and shop until they drop for the upcoming holiday season. We have so many clients come to start their holiday shopping off right. We put out everything that have in stock to make sure we have something for everyone. At this event, all of our jewelry is $20 or less. It’s a really fun way to get people started on their holiday shopping and allows them to cross multiple gifts off their list for a great price. This year the event is Sunday, November 2 from 1 p.m. to 5 p.m. at the Anderson Senior Center in Anderson, Ohio. We’ll have hundreds of pieces including necklaces, earrings, scarves and bracelets. The event is open to the public, so anyone can feel free to attend! Keep in mind, however, the event is credit or credit only, no checks. Madden: Readers can visit MissEms.com to learn more about our company and even look at some of the pieces we have listed online. Just remember that we have hundreds of other pieces that we bring to home parties, fundraisers and open houses – what you see online is just a small sampling of what we sell. Readers can also visit our Facebook Page to check out what we’re putting up and to see our newest items. We also tend to do specials based on our customers’ requests on Facebook.